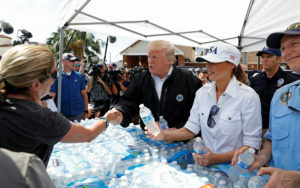 PANAMA CITY, Fla. (AP) — President Donald Trump got a bird’s-eye view Monday of Florida communities left in ruins by Hurricane Michael, including houses without roofs, a toppled water tower and 18-wheel trucks scattered in a parking lot during a nearly hour-long helicopter tour of portions of the Panhandle. Trump initially saw uprooted trees and houses with blue tarps covering damaged roofs after his helicopter lifted from Eglin Air Force Base near Valparaiso. But the severity of the damage worsened significantly as Trump approached Mexico Beach, a town of about 1,000 people that was nearly wiped off the map in a direct hit from the hurricane and its 155 mph winds last week. Many of the houses in Mexico Beach had no roofs. In some cases, only the foundations were left standing. The water tower lay on its side and 18-wheelers were scattered in a parking lot like a child’s toys. Trump also saw Tyndall Air Force Base, which was heavily damaged by the storm. Reporters trailed the president in a separate helicopter. Trump landed at an airport near Panama City, where power poles bowed toward the ground, pieces of metal roofing were scattered in brush land and pine trees had been uprooted or were snapped off halfway up their straight trunks. 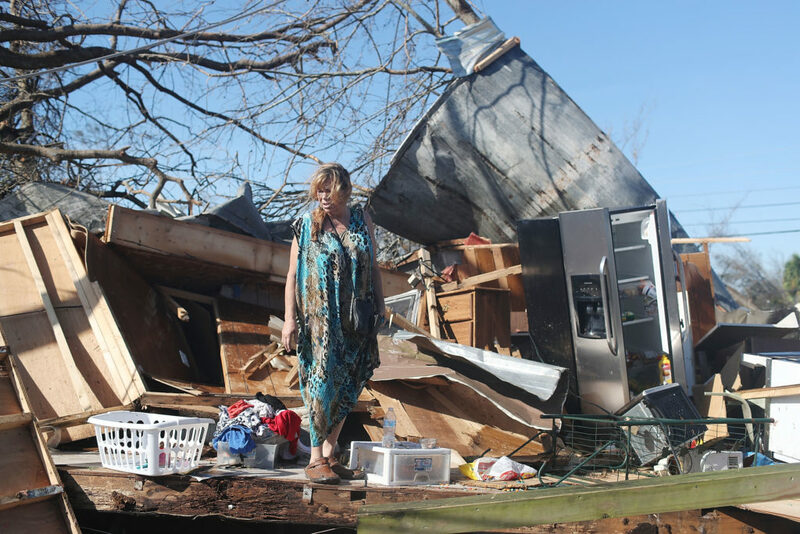 On the drive toward Panama City, he and first lady Melania Trump could see houses smashed by trees, bent billboards and a demolished trailer park. Power crews were working to restore power. In the nearby city of Lynn Haven, where blue tarps topped many of the homes, Trump walked up to a house where a massive pine tree lay on the front yard next to a palm tree that stood tall. Repairs were being made to the home, owned by Michael Rollins, who told Trump he rode out the storm. More than 190,000 homes and businesses in Florida were without electricity as of Sunday. “I knew I had made my commitment to stay with my animals. I have two dogs and a parrot,” Rollins told Trump. More than 190,000 homes and businesses in Florida were without electricity as of Sunday, along with about 120,000 in Georgia, where Trump also planned to survey hurricane damage. People were also grappling with widespread cellphone outages. Florida Gov. Rick Scott greeted Trump upon his arrival at Eglin Air Force Base, and Trump immediately praised Scott for an “incredible” storm response. “Every time I’ve called, he’s come through,” Scott said of Trump. He tweeted after arriving in Florida that he is “also thinking about our GREAT Alabama farmers and our many friends in North and South Carolina today. We are with you!” Trump also planned to survey hurricane damage in Georgia on Monday. The death toll from Michael’s destructive march from Florida through to Virginia stood at 17, with just one confirmed death in Mexico Beach.